J and M Models. 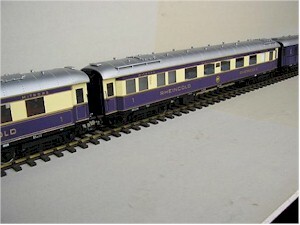 Hand made model railway carriages. The Rheingold trains ran basically from the Hook of Holland to Basel along the Rhine Valley, they were the Mitropa Company's answer to the "Wagons Lits" and ran in sets of 5. We have modeled all 5 cars plus a combination 1st/2nd class car,which can be used with other period express trains in Germany, Switzerland, Holland, etc. 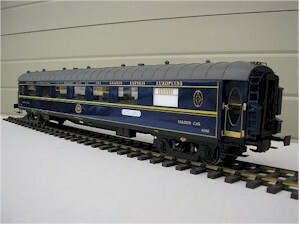 "COMPAGNIE INTERNATIONAL DES WAGONS LITS ET DES GRANDS EXPRESS EUROPEENS" (CIWL)- magnificent, luxurious coaches from a forgotten era. "Train Bleu," "Simplon Express," "Flèche d'Or," "Etoile du Nord," etc. etc. 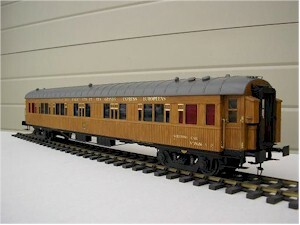 This "Wagons Lits" sleeping car was the last car to be made in wood, and ran with the new all steel sleeping cars which became the famous"Trains Bleu"
Our model is made mostly from brass, and the teak effect is achieved by several layers of paint, very skillfully applied. The finished effect feels and looks more like wood than wood itself. Similar to our other sleeping car,but lettered in German Language, an ideal alternative running number when assembling a train.